Disc 1: Susan shares with you three of her best and highly instructional games on how a grandmaster thinks, reasons, and approaches each move. This DVD will help you to take these easy to follow ideas & principles and apply them to your own games. Disc 2: The Polgar sisters Susan, Sofia, & Judith along with their parents give their first public appearance in over 10 years. The Polgar sisters reunite for a historic 81-board Triplex Simul, where each sister will alternate moves at every board. 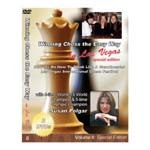 This DVD also contains interviews, a questions & answer session with the Polgar Family, and a bonus lecture by Susan on Chess Principles, Tactics, and Combinations.